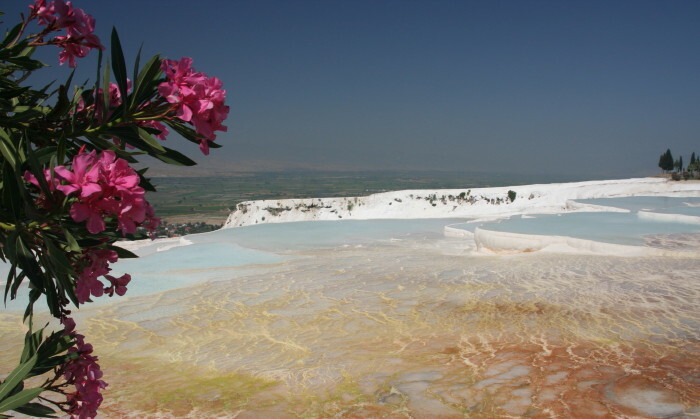 And so 1001 Milez Expedition in Turkey has reached marvelous Pamukkale. From ancient times springs have washed out calcium here. Yes, yes, not salt but calcium. From Roman times this hill was used as SPA and thermal resort. Nowadays its under UNESCO protection. See how it was looking during Roman times – with main street right on the edge of mountain, with colonnade of shops and cafes, amphitheatre and arena. 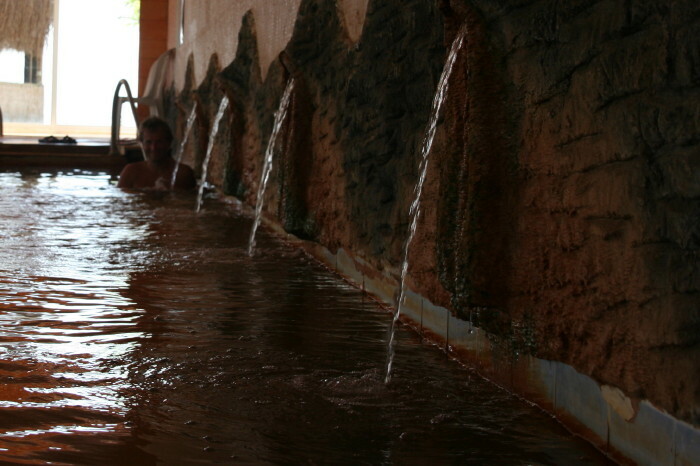 If there was not enough fun with calc pools, you can enjoy swimming in bubbling mineral water pool. Swim between columns still telling about glory of ancient times and imagine you are one of those roman citizens. There is pump taking water right from the full of swimmers basin. Here you can collect healing water for further drinking just for free. If it still was not enough for you, enjoy walking Hierapolis ancient streets in early afternoon, when air temperature reaches 45 degrees Celsius. Climb uphill till amphitheatre where Romans had wine flowing by special grooves during performances. Just imagine how on this main street Romans had wine parties all along, but on table in front of you they offered some animals letting blood to flow into sewerage system built under the street. Ok, and if you got still not enough, go to local SPA hotel. Here you can catch real 40 degree Celsius spring, coming right from underground. If I am so calm in this photo its just thanks to 1/500 exposure time of my camera. Swimming in similar temperature pool was mission impossible even for legs, not mentioning upper… But we managed! Boiled in hot spring you can get great cool down in hotel swimming pool. BTW you can swim right to your dinner. And at the very end treat yourself by visiting local onyx factory. Some says even dust of onyx is good for health. 1001 Milez in Turkey further go to Cappadocia – other wonderland of stone labyrinths.